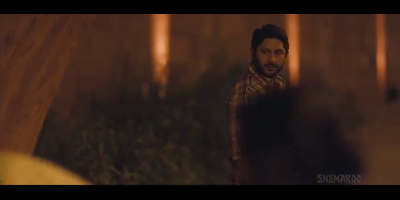 Arshad Warsi is about to pee on the roadside. and politely asks him to move few steps away to pee. He turns back and watches the family lay their sheets. He realizes his mistake and ponders over the bigger problem. Men urinating in public places is a common sight in India but I wept after watching it. More than the fact that I was moved, I knew I had done so much wrong in my life. I have littered the roads, thinking I was throwing a bus ticket or a toffee wrapper and what bad it could possibly do to the dirtiest roads of India. But, after watching that scene, I felt I threw trash in someone's bedroom. In India we don't just drive on roads. 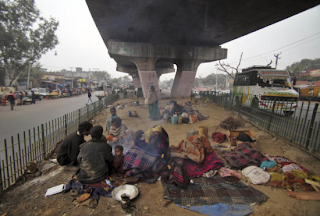 We set pandals, we have weddings, we eat and unfortunately, many live on roads. Do we spit or pee in a place where we eat or sleep? 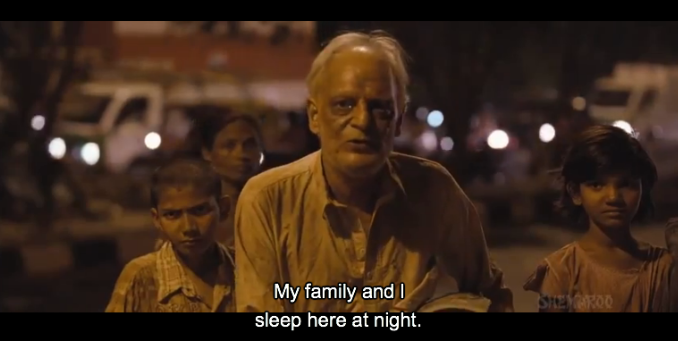 There are 78 million homeless people in India. According to CRY, there were 11 million homeless children sleeping on the streets in 2006. And the situation is getting worse day by day. While you were putting soft toys on your daughter's bed, someone opened a car window and threw an emptied beer bottle on the street, sorry, on a kid's bed. Can you bear this thought? I can't. We were taught not to litter, as cleanliness is next to godliness but this scene has given me a different and sad perspective to the whole situation. Road is not a trash can, for millions it's their bedroom. Some will say that there are shelter homes run by government but when you ask homeless people, they prefer sleeping on roadside. Most of the shelter homes are infected by diseases and are poorly managed. Also, homeless people don't have enough money to travel from their place of work to shelter homes every night. The situation is even worse in big cities as 40% of the homeless people are from metros. When as a kid I used to leave food on my plate, my father always said, 'there are millions of children who don't get food and you are wasting it…' I guess, that was the best trick he had to teach me the value of food. Sometimes, a different perspective works better that the usual approach. What all the moral lessons couldn't imbibe, a movie scene did in less than a minute. I saw and I learnt one of the most important lessons. I bet, most of us do more than driving on roads. So, lets practice 'Cleanliness is next to godliness', outside our homes, where millions of Indians live. I remember watching this movie and this particular scene stirred my soul too. You have put it so well in just a few words. Kudos to you once again Saru for a very well written post. It has the same impact on most of us and thanks for your encouraging words Pooja. You are right, I have seen it myself. We have to find a way through bureaucracy. We need serious action and that too really fast. Thanks for reading and sharing your views. superb post. Loved the moral behind it. We take such simple things as these for granted, dont you think? Yes, we do. We need to change the mindset. I read your post, it was a comprehensive list of what we need to make India a better place. We both are echoing the same cause. It is so nice post... And you are so right we should care about.. Actully i also did mistake some.. Time. After reading this i realised my mistake.. We tak care next time.. Keep writing..
We must learn from our mistake and spread the awareness. Amazing presentation and a very worth lesson taught. Urban India is still getting a little conscious! the other day, I saw a young college going girl may be .. picked up the bisleri bottle .. and put it aside the road .. we have dustbins .. and people make the area around it a dustbin zone !! I know, we can't tell someone to do things, they feel we are too preachy. But spreading awareness is a duty. After all it is for the benefit of the nation. I hope many feel that it is our country and we must do everything to make it a better place. Have not watched this movie. Reminded me of the 'Streetlawyer' by John Grisham. True Saru, we need to be more sensitive about such fellow citizens. Haven't read the book and yes we need to be sensitive towards those who can't afford the basic necessities. A great post Saru..I am going to make my daughter read this post as she always asks me why I ask her to bring back her chocolate wrapper or the empty chips packet home if she does not get a dust bin to through..Thanks for sharing..
A different perspective helps. Thanks for reading Ranita and hope your daughter agrees with us. I hope one day everyone realizes this and treats the streets and road as their own! In the mad race to outdo each other in material world these thoughts are given a 'go by'.Best of luck for the contest, Saru! You're right. We don't care about anything but us. Thanks for reading and your wishes Sir. Saru that was put together so well. Agree that about keeping our surroundings clean be it roads or anywhere. Movies are so powerful and being a movie buff myself I can very well relate to all that you have put together so neatly. Loved this one too and thanks for sharing. I hope one day everyone realises and pitches in to understand that cleanliness is closest to Godliness. I hope so too. I hope to awaken to a bigger and better cause. Thanks for reading. Nice Saru. Yes this scene had a effect on me too. It is indeed a powerful scene. Nice post.. Especially the moral behind the story has come out really well.. I have always wondered why people spit or pee at the road side.. Never thought it could be home to someone.. But your story reminds me of this man who scolded the other guy for peeing on the roadside..he just started shouted at him. He said he had planted some trees there.. And how can someone pee on those trees.. Beyond the trees he had kept some place and was planning to build a small Mandir there.. I don't know why ppl take the name of god to avoid such circumstances.. And especially in India they write names of god or paint pictures of god so that ppl don't litter.. And I don't know why people can pee or throw something on the roadside even it's not god or some tree planted there.. The place belongs to us all. I know each one of us have done it sometimes or the other.. Hope we all don't repeat it again just thinking that it is a home for someone else.. Beautiful thought.. And a very thought provocating post.. Keep writing..!! We need a moral dose, we need to think as a country and stop thinking only about us. You are right, why we need religion as an excuse for everything, can't we do things just because it is right. Thanks for reading and for sharing your views, Priya. Absolutely! Thanks for being a part of it. Thank you Vaisakhi and good luck to you too. Awesome and very painful insights. I wish there were simple magic wandish solutions to all this. Seriously, wish it disappears overnight. Very Nicely written. Definitely an eye-opener for people who din't realize the intensity of the situation! Thank you and welcome here Sharu. i couldnt agree with you more on this...sometimes a different perspective is needed to bring the change. telling someone not to throw litter on the road may not work as effectively as telling the same person not to throw litter at a place where 100's of people sleep at night. i have seen the movie and was moved equally by this scene. loved the post and the whole narration. A different perspective which can make a bigger impact. I hope we all can see the intensity of problems we have in our country and change for better. Yes, the scene is intense and same effect on everyone of us. Thanks for reading and for sharing your views. My bows to you . Thanks for enlightening and finding a new rent free home (lol) . Rent free...I think, those who can't afford food never think from that perspective. Very moving thoughts Saru.We who are well settled can never imagine what the homeless have to go through.Just imagine the plight of those who have to sleep on dirty roadsides.On top of that inebriated drivers just ride over them-and they are seldom punished. Yeah, that adds more misery to the situation. Privileged people should be more human to the needs of less privileged ones. I guess it is not that easy in india .. people need to be educated about these issues, and should be realized indirectly it is them only who gonna to face problem of it .. well written post ! Yeah, they should know that we are a country and anything wrong will eventually affect us. Thanks for reading Ankur. I am moved by the sensitivity and compassion of a human being and that of an Indian! The nobility of the post will haunt us every time we seek to intrude into what you term as the bedroom of those hapless people, our own countrymen. Glad that this post evoked such feelings in you. Thanks for reading. What taught in school seems to have forgotten after... A harsh reality. Hope we follow the idiom as said by you, 'Cleanliness is next to Godliness'outside our homes. I hope so too Rohan and welcome here. I have not seen the movie. But this genre of movies is doing a great job by bringing out the issues to the fore, hitherto ignored or swept under the carpet, making us think about our actions. And through your post you have reminded us all. Kudos to the new wave of cinema and the author of this post. Yes, these movies are doing a good job. They are entertaining and teach us valuable lessons. Thanks for a generous comment and welcome here Bushra. Thanks for the message. An eye opener. That is true, clean country would have manifold advantages. Thanks for reading and do watch the movie, it's a great satire. A thought provoking post Saru. Why don't people litter, spit or pee in Singapore, is it because they all are highly educated or have very good morals? They observe cleanliness and hygiene because the Govt. and Administration is so strict and implements heavy fines if the Citizens indulge in such acts. A child completes homework if he knows that he will be punished. If he is given a moral lecture, he will nod his head but will not do the homework until next lecture or punishment. So, the first deterrent is from the Administration. In Dubai, Al-Ain, there's no way that a person can throw a pepsi can or trash on the roads for they fear that they will immediately be caught and penalized. As long as Admin is weak not only this those who have homes are also unable to sleep due to robbers and thieves. That is true. We know that in India nothing is taken seriously. Littering is nothing as compared to heinous crimes committed in our country. A very good post Saru ! And I am glad that you highlighted this from the movie ! Even though I have always advocated good civic sense , somehow never thought on the aspect of homelessness. Indeed a very good point ! in this competitive world scenes like this makes one realize a lot. you have done a great job! It is something that is programmed in most brains, that we can litter around anywhere which is not our home. Whatever happened to 'Vasudhev Kutumb', it is a pitiable state of affairs. And yet, we sleep so peacefully, on a rising pile of trash. We've been taught that it's not 'The Earth', it is 'Mother Earth', is this how we treat our mothers? No. Things have to change, little by little, person by person, if we are to make a difference. Yes, we have to bring the change, it may be slow but there must be some action form our side. You are right, certain things are embedded in our heads, we need to erase those and upload the better version. Thanks for reading and sharing your views Anshul. Yeah, we should think about them before littering the roads. Thanks for reading dear. You have highlighted such a grave problem in so few a words! It was really very moving! You have a heart filled with love and warmth. I remember this scene but you've brought out a good point very nicely through the most common media - cinema. Loved the scene and the message you shared. It's such an important message. Thank you for sharing. Yes, we can! Chalta hai attitude is doing a lot of bad to this nation. Nice post with a great message, Saru! I loved this movie and this scene really stirred my emotions ... this is s true of the modern society ... you have highlighted the issue brilliantly. Thanks Amrit! This scene is indeed very moving. really a good scene and really the good writing as well. We all think road as a dustbin after reading your article we should think about it again. I hope we change with time. Thanks for reading! You targeted and hit at perfectly the right spot. Unfortunately, those homeless people themselves are not averse to littering. It is just a way of like with us. To do away with this evil, we will need a change in people's thinking as well as stricter rules (which are actually adhered to). Surely, we need more rules and I am talking about the more privileged and educated people who resort to such activities. Wonderful post as always Saru. All the best! Thanks for the post... God bless you... feeling more responsible now for anything I do...!! I don't have understand of this medium but yes, I connect with some movies. Maybe, the message is clear and is projected in impressive way. Glad you connected with this post. Welcome back, Amrit! You must watch this movie. It's a good satire. Imagining Arshad Warsi in this scene gives me goose-bumps for he can be very serious and has the ability to stir our spirits. I'm glad that you have highlighted this issue with the help of this film. Sad plight, our country is in! Yeah! Every time you watch something like this, you wish you have some magical wand to correct things overnight. And yes, Arshad is a very fine actor. Hey Saru.. you have struck the right chord, something we all need to learn at some level or the other. Not only the trash that we spill over the roads, or for that matter everywhere, one question that we need to ask ourselves is whether we have forgotten to differentiate between the trash and the people who are not fortunate enough like us to sleep on the feather beds? We should take time to monitor whether the human within us is still living or not, all of us. My heart goes out for those children on the street. They are sleeping on somebody's spit for no fault of theirs. We can make some difference, if not more, just by some responsible behaviour while walking the roads..
Deepak, your comment is a clear and harsh reflection of what we have become. And yes, street kids are the most unfortunate and my heart cries for them. One of the biggest realities of our country and the number is increasing day by day. Thanks for your wishes. I haven't seen this movie.. not yet..
we think that these little things doesn't matter..
it is so tiny in our eyes but well story has a whole new aspect when seen from someone else's eyes.. Nothing is too small to neglect, I would say. Watch the movie, you will enjoy it. When we think of a certain situation from our point of view, as in, would we litter our surroundings, that is when we would realize that others are equally humans like us. I've done that many times and realized I was wrong when I was at the receiving end of things. A lesson learnt the hard way, but I would never forget it. Being in someone else shoe brings you closer to pain. And when we do that we realize our mistakes and never repeat it. As usual, you have written it well. I haven't watched this movie, however, this scene is so poignant. During our childhood days we were taught that "Sarva ghate narayana" means God is there in every object. Today we have forgotten those values. When we visit a foreign country we are conscious and look for public lavatories rather than urinating in the open. The same people don't give a thought when they are back in India. There was a time I used to trek in the jungles and drink water from the streams. Today, I find plastics, undergarments, bottles and other trash in the streams. We are poisoning the water at the source. Lot of our wildlife suffer due to that. And the pollution is acting as a silent killer for us as well. The situation is grim. I can understand how you feel when you see people polluting the nature. We don't think about big issues. We feel we are not responsible and blame the government. We forget that we have to work collectively. Sadly we have forgotten the lessons we learnt in childhood. Thanks for reading and welcome back! Millions sleep on the streets . but the sleeping womenfolk are not safe and are a prey to violence and anti-social elements. A good night's sleep after a hard day's work eludes them. Men peeing on the streets is, unfortunately, considered chalta hai in India. Sad indeed. Few years back, one music channel - maybe MTV India, had a series of TV clips where they interview men while they are peeing asking questions like - "What are you doing? ", "Why can't you wait till you reach home?".. Those were funny and I thought it would make a difference. It didn't. These same people, when the go to US / Europe think twice about peeing on streets! All about our "chalta hai" attitude..
Binu, if I tell you there was an Indian couple on the grounds close to White House in DC making their infant pee in public, would you believe me? I died of shame that day. It's hard to change Indians. I've never thought about littering/spitting/peeing this way Saru. Thanks for the perspective. 1. it's India that we're dirtying (and after it we talk about how stinky/dirty certain areas are. Never this. Thanks for the perspectvie. I've never see this ad, but wow. Hey... thank u soo much for sharing ur thoughts.... really its a time for our indian people to understand these things for better future.. When you see the comments run longer than the post you can realise there is some substance in the post to ponder. We practice and preach our kid the policy of having general civic sense towards this world and more importantly the surroundings. I remember my parents inculcated the habit of not letting food go waste at any cost. Once its on your plate then everything has to go into your mouth straight. What an epic topic to write and to also put it across in an effective way. Hats off. There should be certain moral sense in each individual which should in turn into us being better human beings, transcending our self interest. I've never seen the movie, however, your post is very nice. It's a good movie, do watch it when you get time. I remember watching this movie in a not so filled up hall. Thanks for bringing the scene again to my mind and connecting it into an awe-inspiring post. Good one. That was a really nice scene in the movie. It is indeed time we stopped ignoring the squalor that surrounds us and instead began to reflect upon how to bring a change in their lives. Right, high time for action. I think we have a different perspective. I was concentrating on - why we shouldn't litter, not on encouraging letting homeless be homeless. I wrote on a scene that moved me to think about a problem from a newer perspective. Good to know that and welcome here. Saru, You reminds me of those days(2005) when I feel sad about small children as young as two sleeping on footpaths in Chennai. Oh, such a heart breaking sight. The best part of your writing is that you have written on most of the topics. This particular one has to be an eye opener for each one of us. Heart touching. wonderful post I don't know hw I missed it. great one. Me too used to get angry by the littering attitude of us Indians. Now I m tired of it. I just do my part and hope others do theirs. You must write a book! how did I miss this post ? This is the cry of a real desi like us who wants to see some little change at least in the realms of cleanliness. Hoping you could write a book on the bad things happening in India in similar way so that it stirs everyone's soul for a long time. Yes we must change it I usually carry the chocolate wrapper or paper in my pocket until I find a trash can. Even paper boxes and plastic bottles which should be stored in homes since they are hazardous to humans and do not decompose are easily thrown away in these Indians bed rooms and imagine the broken sharp glass bottles and rusted nails they could injure and kill someone with sepsis. OMG you really stirred my desi in me. Hoping you write a book with all the bad things either as poems or events or thoughts. Thanks for an encouraging comment, Nikhil. I hope every body makes an effort and we can change India for better.